The San Jose Blog: Hotel De Anza is Getting a $5 Million Upgrade! Hotel De Anza is Getting a $5 Million Upgrade! 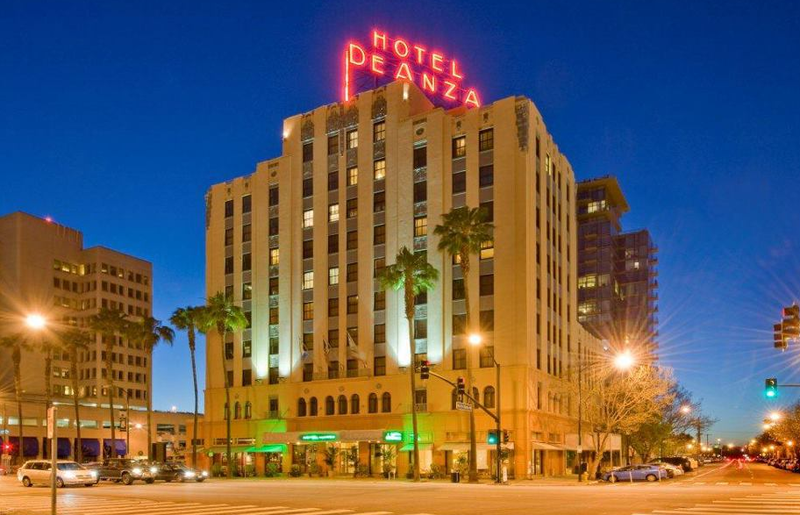 The historic (and awesomely Art Deco) Hotel De Anza is about to get a serious upgrade from its new owner, Lowe Enterprises. Being 84 years old, it has quite a storied past. It was one of the first luxury hotels in San Jose, hosting such guests as Eleanor Roosevelt, The DuPonts, Jack Dempsey, and Fred MacMurray. Then it fell into disrepair and was almost torn down in the 70's. Luckily, the late San Jose Redevelopment Agency saved the building and restored it. The Hotel De Anza as we know it today was re-opened in 1990, just in time to compliment the new San Jose Arena. Now that over 20 years have gone by since the latest major renovation and the Downtown hotel market is doing very well, the timing is perfect for a major overhaul that will keep and perhaps even enhance its historic character. Lowe Enterprises is going to spend $35,000 on each room, which will include a full redesign of the rooms with modern bathrooms, new beds, new furniture, and newer tech/amenities. Another $1.5 million will go into upgrading common areas and other parts of the hotel. In addition, Lowe is considering improving the food program and may even add another eatery on the ground floor that would be open to the street. I'm assuming this would be something more casual since they already have La Pastaia. I consider this great news all around. This is one of my favorite buildings Downtown and it deserves a decent upgrade. Soon there will also be an AC Hotels building across the street, giving San Jose visitors a choice between both vintage and modern luxury on Santa Clara. THAT is really great news! Love the DeAnza, what a gem. S.